Clay Street Mini-Park is a sloping lawn located to the north of the Presidio Branch Library. 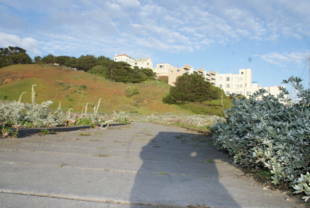 There are two access points to the park: Clay Street, going downhill, or from one of the two cement walking trails leading from Sacramento Street, through the Presidio Library Mini-Park and past the library building. Muni access: 5-Fulton, 18-46th Avenue, or 31-Balboa -- Cabrillo/La Playa/Ocean Beach; walk north on LaPlaya to Balboa, then west to the ocean, or cut west through the brick pedestrian walk at the foot of Cabrillo to Great Hightway, then north to Balboa. History: Prior to restoration, the site had been used for construction staging for the Richmond Transport Project and subsequently became available for recreational use. 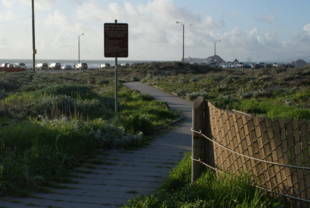 The boardwalk and dune construction began in 2002. 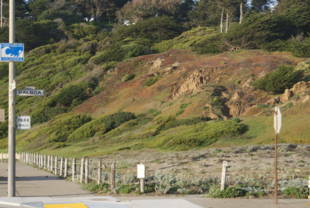 Sand from beneath the De Young Museum was used to create dune mounds. 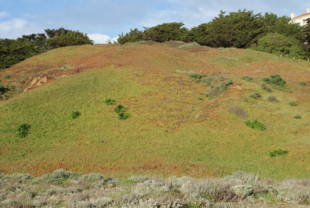 Fore-dune and back dune vegetation was planted by contractors and volunteers in 2003, 2004, and 2005. 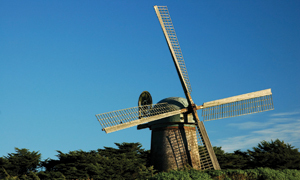 --February 2006, 'Significant Natural Resource Areas Management Plan', San Francisco Recreation and Park Department.